If you have to go, you need to buy a Travelpro. No other bag can match the proprietary "Magna" wheel technology on our two top carry-on picks. 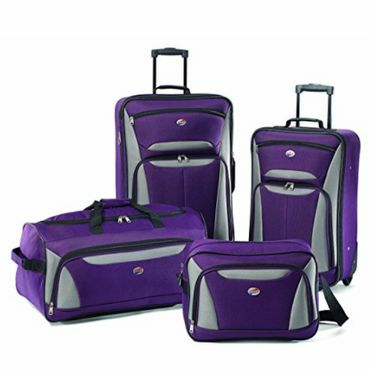 Best of all, the Platinum Magna line comes in a variety of sizes, so you can choose a suitcase for any need. Specs that Matter Weight - 7.9 lbs. 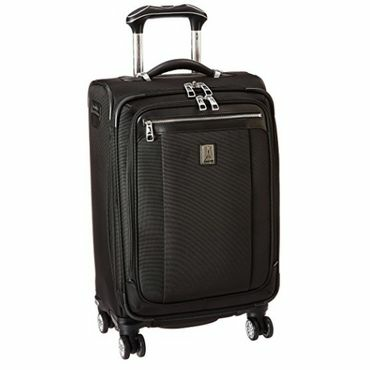 Capacity - 1,660 cu in Size (H,W,D) - 21" x 14" x 9"
Experts say that Travelpro's "Magna" wheel technology has revolutionized spinner wheels by keeping the spinner wheels aligned whether you're pushing, pulling or gliding the suitcase along beside you. Reviewers also praise the comfortable, contour grip handle and durable construction. There are six pieces in the Magna 2 collection, so there's an option whether you want to check your bag or carry it on. In the latter case, we recommend the 21-inch Expandable Spinner Suiter. Best of all, the wheels can be easily replaced. Specs that Matter Weight - 7.7 lbs. 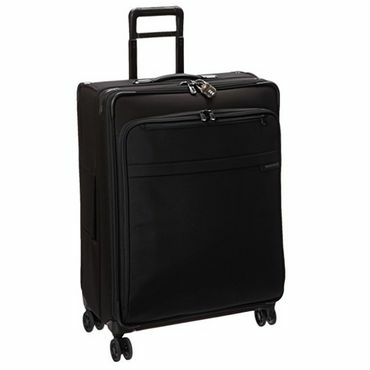 Capacity - 1,850 cu in Size (H,W,D) - 22" x 14" x 9"
Many travelers prefer rolling bags with two fixed wheels. 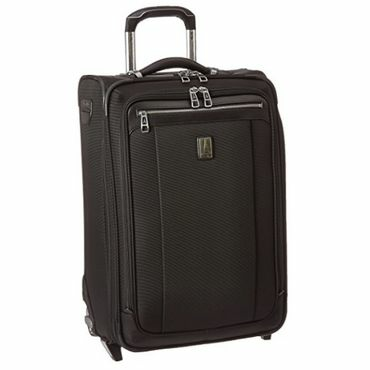 For them, experts recommend the Travelpro Platinum Magna 2 22 Inch Expandable Rollaboard Suiter. It's part of the same line as our Best Spinner Luggage selection, but with two sturdy wheels and a slightly larger capacity. These bags are reported as durable, well-balanced and comfortable to pull, and the 22-inch bag will fit in most overhead bins. As with its spinner sister, the wheels are easily replaceable, and the collection includes a wide range of sizes. Specs that Matter Weight - 11.9 lbs. Capacity - 6,292 - 7,431 cu. in. Size - 25.5" x 20" x 10"
If you're a frequent traveler who has ship out for a week to 10 days at a time, the Briggs & Riley Baseline collection will never let you down. The large bag allows you too easily pack for a week's worth of activities, from casual to dressy. It's also available in medium and extra-large, as well as two colors, black and olive. Briggs & Riley's lifetime warranty is outstanding, but the bag is so well-made you'll probably never need to use it. A great luggage set should include the essentials for any travel need, and the American Tourister Luggage Fieldbrook II 4 Piece Set does just that. It includes an under seat boarding bag, a 21-inch suitcase that will fit in most overhead compartments, a 23-inch wheeled duffel, and a larger, 25-inch bag to check for longer trips. Owners say this set features plenty of organizational options; although the bags are on the small side. This set also comes in a variety of color options. This is by far the most popular type. These wheels can spin 360 degrees, so bags can be smoothly scooted along beside you (as well as pulled behind you or pushed in front of you), which makes it easier to transport two suitcases. Spinner wheels used to get panned for durability because they had an annoying tendency to buckle and/or snap off, but manufacturers are solving that problem and spinner wheels are more durable than in the past. The original rolling luggage featured inline-skate-type wheels, also called fixed wheels or roller wheels. Many frequent fliers prefer these fixed wheels to spinner wheels, saying they're more stable, and make a suitcase lighter, roomier and easier to pull. This type of wheel also tends to be more durable. While many hard-core travelers eschew luggage sets, preferring instead to own a specific selection of bags for their various travel needs, luggage sets are still a great choice for those who either need to pack a lot of stuff and want their bags to match, or for less-frequent travelers who want to own a good variety of bags -- and want the discount that usually comes with buying them as a set. The luggage world is pretty much divided into "carry-on" and "checked" bags. The reason is clear: many airlines charge $25 per bag and up (and way up in some cases for a second or, especially, third bag) to check it, so you can save some money if your bag fits into the overhead bin. "If" being the operative word. In addition, some airlines now even charge for carry-on bags, so you may not be able to avoid baggage fees unless you sign up for an airline's loyalty credit card, a topic that we cover in more detail in our buying guide. In general, a carry-on bag should be no longer than about 21 or 22 inches; although a very few airlines will allow a bag as large as 24 inches in an overhead bin -- usually on longer flights with larger planes. Check the airlines' website for their carry-on size restrictions. And be aware that their "official" guideline may not apply to your particular flight. Study your ticket carefully, if it says your flight is "operated by" another airline that is "doing business as" (DBA) your airline, that means you are likely to be flying on a regional jet and your otherwise "regulation" bag may not fit in the overhead bin. If that's the case, the airline will generally gate-check your bag at no charge and you can pick it up in the jetway after you deplane. Luggage is frequently discontinued and updated, almost as often as electronics are, but there are still names that are standouts in any iteration: Samsonite, Travelpro, Briggs & Riley, Victorinox, Delsey and American Tourister, to name just a few. Although we focus mostly on specific, individual bags in this report, keep in mind that all of these bags come in smaller and larger sizes as well, and have the same quality as the size we recommend. Don't hesitate to choose the size that best fits your needs. Just be aware that the bigger the bag, the less likely it can be used as a carry on. We also have some bad news: If you travel frequently you will probably need to replace your luggage frequently. Travel is tough on your bags and even the best bags will fray, get beat up, the wheels will wear out and the zippers will stick or split. Even the cheapest suitcases usually come with a 10-year limited warranty, but good luck getting anything out of it. The list of restrictions is longer than a security line during the holidays. These warranties typically don't cover normal wear and tear (and who defines "normal" anyway? ), damage caused by the airlines (which is the cause of most luggage breakage), or most anything else that actually damages your bag. The only thing most do cover is manufacturing defects, but most warranties don't specify what that means. Also, the comments we see from those who do try to get their bags repaired is that it's a huge hassle. There are exceptions to this -- most notably Briggs & Riley who even cover damage caused by the airline -- but not many. Also, you'll need to hang on to your receipt. Many luggage manufacturers won't even talk to you about your broken bag without it. You'll notice that we don't make any specific recommendations for "lightweight" luggage. That's because virtually all luggage made today is lightweight. Still, it's easy to make some mistakes when looking for bags that shave their weight down to the bare minimum, so be sure to take a look at what we have to say about that in our detailed discussion of lightweight luggage elsewhere in this report. "The Best Carry-On Luggage of 2017"
The editors of ConsumerSearch are very experienced travelers, so we drew on our own knowledge to explain how airlines deal with baggage and offer some tips for how to avoid baggage fees. Then, for our specific luggage picks, we turned to the professional testers at sites like TheWirecutter.com, GoodHousekeeping.com and OutdoorGearLab.com. They put bags through their paces, sometimes for weeks, then report on durability and convenience. Even more important are the actual travelers who can tell us how those recommended bags hold up in real-world use. To determine that, we combed through hundreds of owner reviews at sites like Amazon.com and eBags.com to definitely narrow down the best bags for any travel need.